During the 1970s, Emilio Scanavino increasingly spent his time in his Calice Ligure studio; his manner became simpler and focused on grids and geometrical architectures, which reflected his thinking about the objectification of painting. In 1973, the Kunsthalle in Darmstadt dedicated a vast and analytical retrospective to him. The exhibition was also shown twice in Italy, at Palazzo Grassi in Venice and at Palazzo Reale in Milan. In 1976, Scanavino alternated his artistic activity between Paris and Italy, where in 1977 he presented an important exhibition at Studio Marconi in Milan. 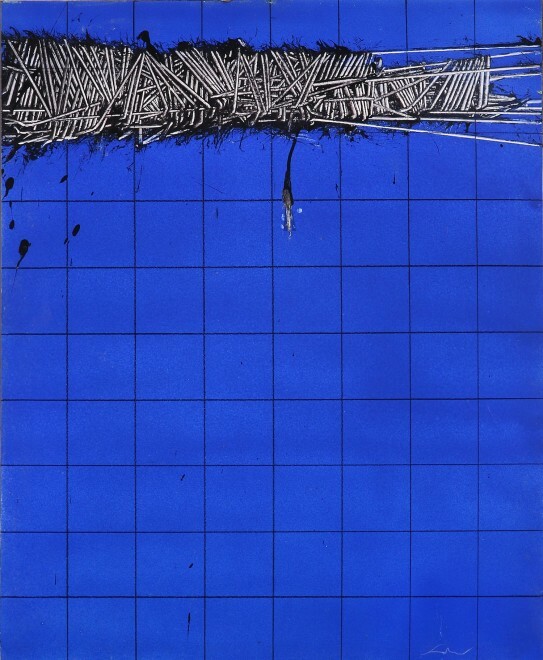 Crucial to Emilio Scanavino’s works from the 1970s was the idea of the germination of geometry as he developed a more conceptual manner in his painting technique. Painted a year after Con la speranza che l’azzurro resti (With the Hope that the Blue Lasts), in Nel blu (Into the Blue), 1971 we see the widespread application of the colour blue. The extensive void is structured and grid-like, an archetype which became prevalent in Emilio Scanavino’s works of the 1970s. He created the lines of the grids using string which he stretched across the canvas, in a tactile way whereby he was interacting on a more personal level with the work. In the present painting we also see the addition of Scanavino’s paintbrush which was stuck onto the canvas, hanging from a canopy of “signs” above. This could be read as exemplifying Scanvino’s abandonment of his traditional painting in favour of a more conceptual approach, at a time where he was very much also experimenting with three-dimensional forms. The artwork described above is subject to changes in availability and price without prior notice. Where applicable ARR will be added.